Earlier this year, a family of beavers were spotted living comfortably along a river in England, becoming the first of their kind to be seen in the wild since the species was wiped out five centuries ago. But now, in a move that's sparked outrage among environmentalists, officials have announced that they plan to round up the beavers and send them to live out their days in a zoo -- effectively making them extinct once again. When three beavers were caught on film by a camera-trap living along the Otter River in Devon last January, many had taken it as a heartening sign that they were on their way to making a recovery at long last. During the 16th century, the once-common animals were hunted into oblivion for their dense pelts; Since then, only a few beavers had remained in the country, all held in captivity. It believed that the animals spotted in the wild are the descendants of escapees.Not everyone has been happy to see their return in the wild, however. 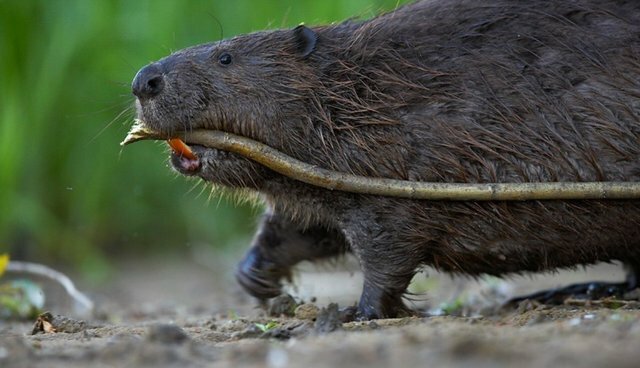 England's Department for the Environment, Food and Rural Affairs (DEFRA) say that due to fears that the beavers could be a danger, they will be captured and relocated. "Depending on the source of the animals, they could be carrying a disease not currently present in the UK," said a DEFRA spokesperson. "In addition, beavers have not been an established part of our wildlife for the last 500 years. Our landscape and habitats have changed since then and we need to assess the impact they could have." The decision has sparked a heated debate among locals who fear that the animals could pose a problem by damming the riverway, and proponents of beaver reintroduction, like Derek Gow, who believe that the animals have a rightful place in their native habitat. "Why should three beavers be three beavers too many?" he asked the Western Morning News. "This will be the first time in history that we have exterminated a native mammal twice, setting an extraordinary historical precedent."